This anthem explores the all-of-life nature of Christian worship, weaving the “Alleluia” refrain through texts from the Psalms that speak of the resolve to praise (Psalm 145:1-2), the recognition of the beauty of God in creation (Psalm 19:1; 104:31), confession of sin (Psalm 79:9), assurance of salvation (Psalm 18:46), and the experience of God’s faithful love (Psalm 115:1, 3). 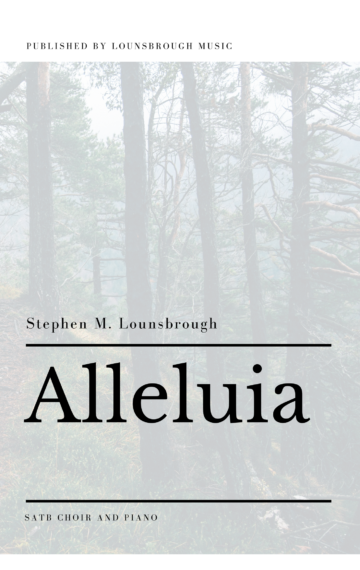 While the work is scored for SATB Choir and Piano, the “Alleluia” refrain is mostly a cappella, setting it off from the Psalm texts. The musical character of the refrain communicates not only a firm resolve to praise, but also a keen sense of need for the grace of God in order to live a life of praise.